The fet11 Exhibition will demonstrate the potential, diversity and the importance of foundational long term research in future ICT. The programme committee has selected 30 exciting exhibitions presenting a mix of impressive achievements as well as early stage results, ideas and prototypes. They will illustrate the wide variety of disciplines, technologies and domains involved in future and emerging information technologies. A robot which swims like an eel is the main attraction at the ANGELS stand. The prototype is made up of nine modules with propellers which can be operated independently or joined together. The robot is equipped with an electrolocation sensor which enables it to avoid obstacles and walls, and to distinguish the basic shape of objects. Fancy yourself as the next Jackson Pollock? Want to find out how music - from Mozart to Meatloaf - can affect your mood? These are just two of the interactive games, videos and interactive displays on show to demonstrate concepts embodied in pervasive adaptation, which refers to the ability of information and communication systems to adapt autonomously to dynamic user contexts. 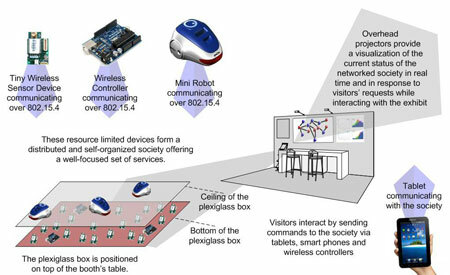 Artificial multi-robot organisms consisting of a swarm of robots, which can dock with each other and share energy and computational resources within a single artificial-life-form, will be demonstrated. Shake hands with ECCEROBOT, a radically new kind of robot with a spectacular appearance. ECCEROBOT looks like a life-size human with the skin peeled off so that the bones, muscles, and tendons can be seen in motion. The stereotype of the robot is usually either dangerous or fragile. This exhibit attempts to move beyond this mindset, and this mindset must be overcome. See robots fly, climb and wheel themselves around as they get on with their work. Or even set them an individual or collective task by writing a simple program. The exhibit aims to show how biologically inspired principles of swarm intelligence can be applied to robotics. Come and see how the vibrations from a car's engine, passenger compartment and shock absorbers can be harvested into electricity. Watch an animation which describes the science behind the “non-linear bistable energy harvester” that converts shaking, rattling and rolling into energy, and estimates how much energy can be produced. Or download an iPhone app which shows how much energy that you could generate just by giving your phone a shake. Meet ShrewBot and his friends, a group of robots inspired by the sensory systems of animals with whiskers. Robots equipped with vibrissal sensors are designed to operate in places in which more conventional sensors fail, like smoke or dust-filled environments or in murky water. Visitors can also watch videos of animals using their whiskers to explore their environments. Why not try out a brain computer interface for yourself? Four prototype applications are on show – you can write text using a mentally operated virtual keyboard, select pictures from a collection simply by focusing your attention on the desired picture, send a mental command to a functional electrical stimulation (FES) system that can deliver currents to forearm nerves to regain control of your hand for grasping, and control a small mobile robot designed for telepresence. Why not get to grips with graphene - the new shooting star of ICT. Visitors can touch and examine prototypes of transparent wafers coated by graphene and test its electrical conductivity. They can also test the protective nature of graphene by putting copper foils coated by a graphene layer on a hot-plate and observing the result. Watch bio-inspired artefacts swimming in a small pool. The artefacts will move in a real adaptive way as a sort of natural "resonant" system, in which mechanical properties of skeletal apparatus and actuators stabilize the system during locomotion. Experimental sessions will be interleaved with presentations describing project relevance and its impact on technology. The aim of this exhibit is to promote understanding of the quantum phenomena of micro and nano-mechanical devices that can be harnessed for ICT and QIPC and for ultra-high sensitivity sensors. Visitors to the stand will get a hands-on experience of nanoscale, opto- and electro-mechanical devices at work and have the opportunity to discuss with top scientists in the field who will show-case key research outputs and link them to wider strategies. Come and see a brain-inspired, or neuromorphic computer in action. Visitors will be able to choose from many different network architectures including biologically inspired cortical structures as well as generic concepts like "Liquid Computing". Staff will be on hand to interactively modify network parameters to demonstrate the typical workflow for using these new architectures. Watch videos of brain-chip recording sessions made as part of the CyberRat project. CyberRat has developed an innovative interface between a semiconductor chip or an ensemble of chips and the brain of a living rat. Small CMOS chips featuring stimulation and recording sites integrated at high-density are implanted in several brain areas obtaining an unprecedented control of neuronal activity in the rat's brain. Roll up, roll up for a game of "quantum roulette". A quantum random number generator will be used to draw winning numbers in a roulette game where visitors can play to win small prizes. The game exploits the unique lattice properties of diamond which allows quantum devices to run in ambient conditions. This exhibit will demonstrate a number of other applications which explore the quantum world, and its promise of better performance at smaller scale with less power consumption. Find out how organic memristor was used to fabricate a functional material structure capable of mimicking the associative learning of feeding behaviour in the pond snail. Watch films showing the experimental data on the signal propagation kinetics in basic memristors and their networks, or showing the insurgence of "hebbian" patterns during the training of a complex phase-separated molecular memristor-functionalized gold nanoparticles composite network. Visitors will be shown a preliminary prototype of this adaptive complex network. This exhibit will feature a number of demonstrations showcasing the potential of biomimetic systems to transform the way ICT technologies are developed and deployed in society. On show: the world's first integrated neuroprosthetic device that in tests has successfully replaced a lesioned circuit in a rodent's brain; a biomimentic chemical sensing robot; a wearable device that allows exploration of complex brain data (EEG, ECG, gesture, movement, including eyes, etc.) and a live stream from an ongoing cognitive neuromorphic engineering workshop. This exhibit experiments on networks built from real-time Internet data, giving participants the feeling they are really “inside” the web and witnessing what is happening right now. The objective is to better understand the processes of knowledge generation and opinion dynamics. Visitors will be invited to enter a dark room where they can interact with a network of news extracted from the on-line press. Looking for a search engine to find images or web pages about David Beckham arranged in terms of the various clubs he has played for? This 15 minute demonstration of LivingKnowledge showcases technologies enabling bias-aware, diversity-aware and evolution-aware information access, including diversity-aware search within texts and images, analysis of future predictions as well as fact-and-opinion extraction. Slip on a pair of sandals, pop a knapsack on your back and experience the sensation of walking over creaking floorboards, mud or even snow without leaving the exhibition. Your shoes detect foot action through force sensors and exchange data with a mobile microphone-based sensing floor. The sensations underfoot increase as the wearer approaches a wall of the exhibit so his or her reaction can be observed as the snow or mud gets deeper. The MEGAFRAME project has designed a camera whose pixels can detect a single photon, and compute its time of arrival, a million times per second. 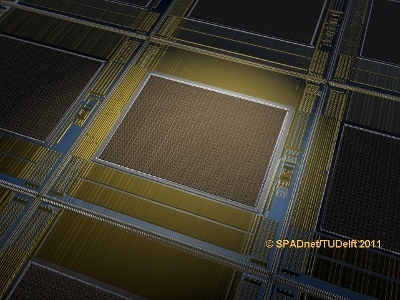 The SPADnet project plans to translate the technology behind this achievement to a new generation of smart, CMOS-based large area networked image sensors, targeted at photon-starved biomedical applications. Take a look at recent prototypes of the system and interact with a single photon camera. You will also be able to see images of the various generations of single photon detectors, illustrating the development chain over the years. Come and see what the Hungarian Bionic Vision Centre is doing to help and assist the visually impaired with technical inventions, such as retina implants and special mobile devices. Our demonstration deeply relies on medical and engineering research when combining emerging technologies to revolutionize the tools for visually impaired people. Visitors will see retinal implants and short videos of patients with retinal implants. Visitors can try out some of these devices for themselves including the implementation of a bank-note recognition software program using a smart-phone. How is science evolving ? Can we automatically reconstruct the history of a research field ? In this exhibition, people will dive into the phylogeny of science reconstructed from the analysis of decades of scientific literature. Participants will be able to select a particular FET topic and visualize its developments through time in terms of keywords, related papers, illustrations and scholars. In absence of interactions, the phylogeny explorer device will permanently unfold the digital traces of science, suggesting paths through the ever-fluctuating landscapes of science. See how implantable neuroprosthetics can restore function for people with vestibular disorders. Vistors can see inertial sensors connected to a laptop showing the real-time movement of a mechanical system simulating the head of a subject, as well as implantable electrodes which are used during in-vivo experiments. Try out Starlab's Enobio Brain Computer Interface for yourself at this exhibit which sets out results and information from research projects on non-invasive brain stimulation and human computer confluence. Visitors can try on the wireless BCI system and test some basic BCI software. More complex demonstrations will also take place with exhibit staff wearing the system. Visitors can get to grips with different aspects of future pervasive display networks with this hands-on experience. The exhibit combines a number of interactive applications running on an initial version of the PD-NET middleware and acts as a starting point for understanding the underlying concept of pervasive display networks.